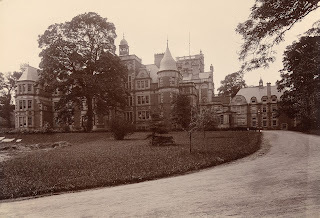 Nurses were regularly called upon to participate in activities for the spiritual wellbeing of the Royal Infirmary of Edinburgh during the 19th Century and well into the 20th Century. At that time, these activities usually drew on the Christian tradition. Nurses regularly said prayers in the Nurses’ home and attended services at the hospital Chapel, formerly part of George Watson’s School. When the hospital moved to Lauriston Place in 1879, Angelique Lucille Pringle the Lady Superintendent of Nurses and her staff, along with Miss Forsyth the last Matron and her staff, contributed £85 3s, 3d to present an organ for the Chapel. 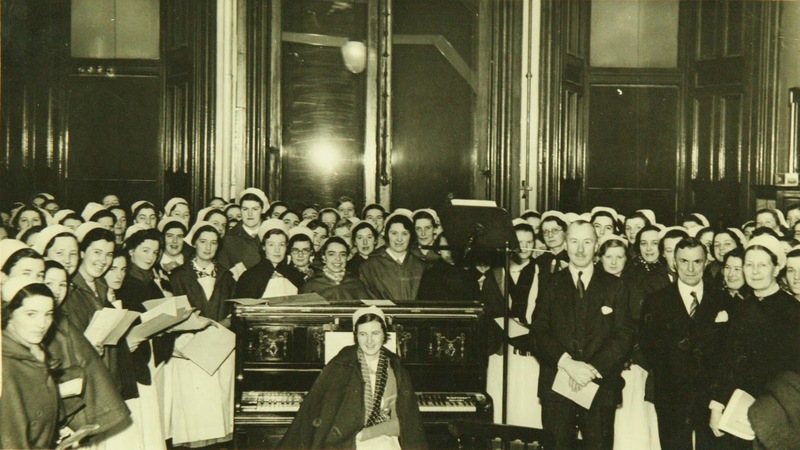 At Christmas time nurses performed an annual concert and sang carols to patients on Christmas morning. 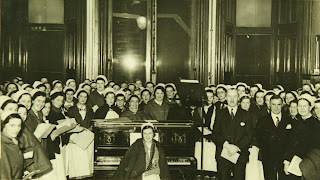 A piano was placed between wards and the nurses sang around several different locations so that all the patients could hear. The photograph shows nursing and medical staff in the central hall of the Royal Infirmary at 6am on Christmas Morning 1936. Up bright and early: carol singing at 6am on Christmas morning 1936! We wish all readers of our blog a very Merry Christmas and a Happy New Year! We recently finished the first phase of treatment to some surgical instrument makers’ drawings from a company that were based just round the corner from the Archive: Gardners of Forrest Road, Edinburgh. The collection came to us in poor condition. Housed in nothing but an old cardboard box, the loose sheets, sketchbooks and catalogues had accumulated a thick layer of dirt making it difficult to see the drawings. Even the most careful handling meant that we were transferring dirt to other parts of the collection and all over ourselves! Cleaning and re-housing is all part of the process of ensuring that collections are stable once they enter LHSA, and that they are able to be used in future. We blogged about this kind of work in October when we accessioned a large number of index cards, so we're used to getting our hands dirty to help preserve the collections! 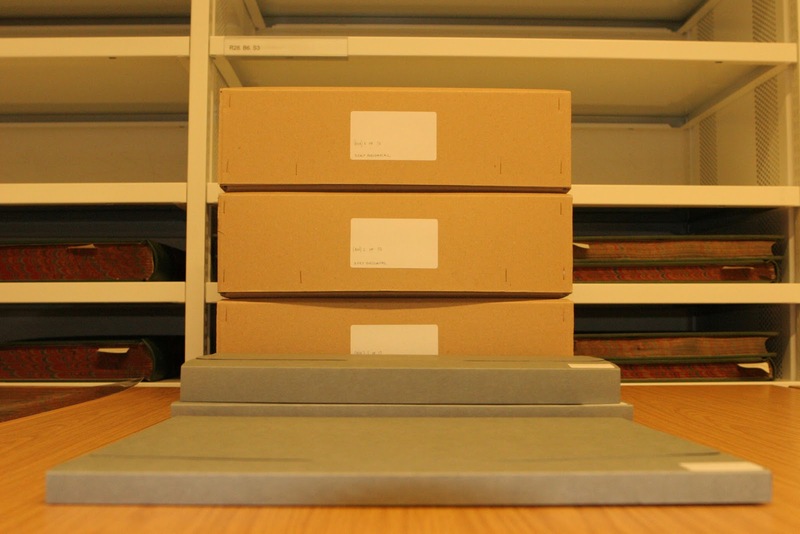 Each item was carefully surface cleaned and the items re-housed in high quality folders and boxes. This was an incredibly time consuming task, undertaken in stages over the last five months. But the hard work has been worth it – the drawings have been revealed and we have discovered that the many of them were designed or commissioned by medical practitioners whose papers we already hold in the Archive! It’s been a team effort to improve the condition of this fascinating collection: Ruth surface cleaned all the papers, Mariko (one of our previous conservation volunteers) repaired two of the larger sheets, and Fiona and Sandi (our current volunteers) produced custom-made folders. 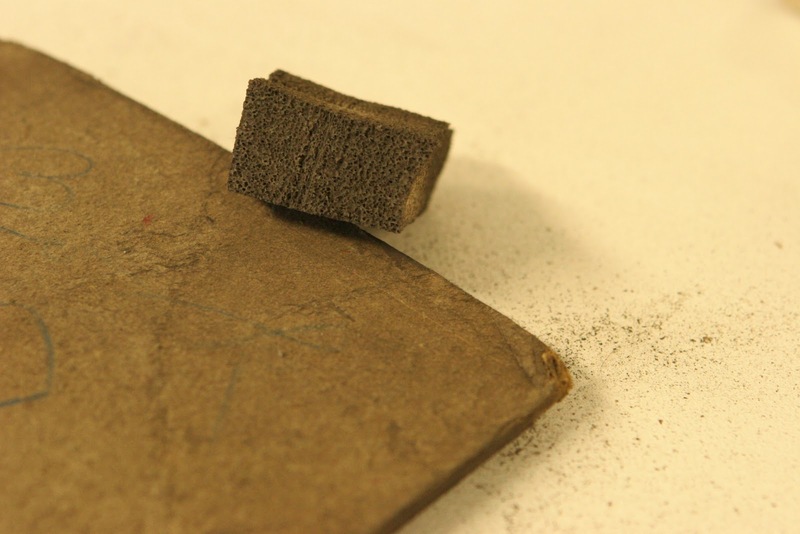 The conservation treatment carried out so far will make this material more accessible, but there’s still a lot more to do. 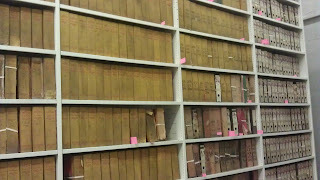 Laura has assigned a collection reference number (GD47), and our archive volunteers will go on to catalogue each item. In the future, GD47 will return to the conservation studio for the second phase of treatment – to repair physical damage to the paper sheets. As 2011 draws to a close, it’s a good time to update you on our volunteer programme. 7 people have participated this year, gaining invaluable experience and enabling the Archive to undertake important cataloguing and conservation work. On the archive side, our current volunteers are Claire Kirkpatrick and Lynne MacMurchie who are both hoping to train as archivists in the future. They each came to undertake the one-day taster sessions that we’ve introduced this year and this led to both gaining long-term placements. Claire and Lynne are about to complete an oral history transcription project, providing access for the first time to engaging testimonies from staff & volunteers at the Royal Edinburgh Hospital whose careers span from the 1920s to 1980s. The interviews were carried out by clinical psychologist Jill Birrell in 1993 in preparation for a book she was to write about Craig House. Due to her untimely death shortly afterwards, they were transferred to LHSA. Now digitised, each of the 21 interviews has been summarised for the catalogue and full transcriptions are underway. 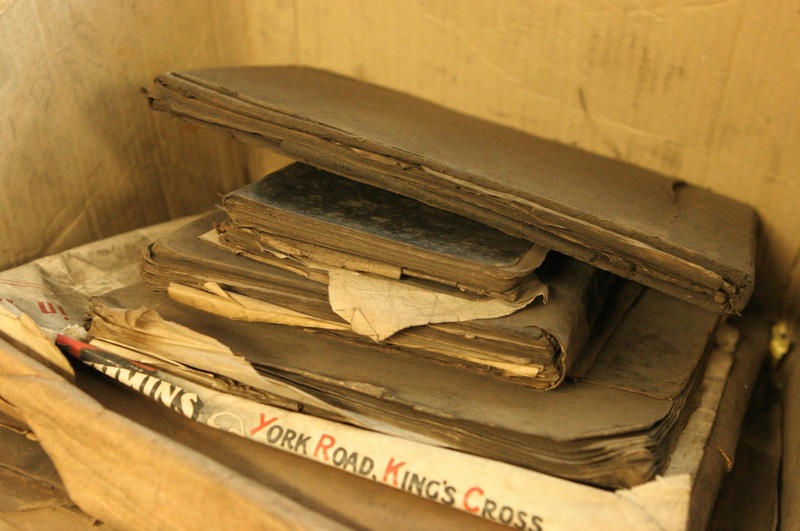 In addition, research papers and photographs collected by Jill Birrell have been catalogued. As well as providing an insight into the workings of the Hospital over a 60 year period, the interviews capture something of the social side and the interactions between staff and patients. Opinions are given on a wide range of topics including: the changes brought about by the introduction of the National Health Service in 1948, details of psychiatric nurse and medical training, ghosts, and the treatments given to patients. We’d like to thank all of our volunteers for their hard work this year, and look forward to welcoming them back in 2012! If you’re interested in becoming a volunteer at LHSA, please complete an application form at the foot of the following page: volunteer application form. LHSA’s case notes continue to be re-ordered and audited. The current case note audit follows on from a project for case notes affected in a shelving collapse. All those affected in the collapse have been re-ordered so attention has turned to the rest of them, many of which have not been checked for many years and contain disordered elements. The batch of case notes now receiving attention, and very near to completion, are those from the Royal Infirmary of Edinburgh (RIE) Ear and Throat collection, dating 1930-1953. The surgeons practicing during these times included Mr JD Lithgow, Dr G Ewart Martin, Dr I Simson Hall and Dr JP Stewart. They include notes regarding what was then the routine practice of removing tonsils and adenoids to much more complicated cases of treating hearing loss and cancer. The case notes were housed loose inside 657 box files. As re-ordering was carried out, a handlist was produced with information about every box file, including the alphabetical sequence, the number of case notes inside and any anomalies in the sequence. Most of the notes have been kept in the original box files for now, with only those inside files which were decaying or damaged re-housed into archival boxes. As always, there are peculiar finds that are made when checking through such material. Some interesting finds amongst the notes have been early recommendations from a doctor that a patient should cut down smoking, a small collection of previously unknown RIE case notes from 1918-1919, and pages from the Eagle Annual 1958! 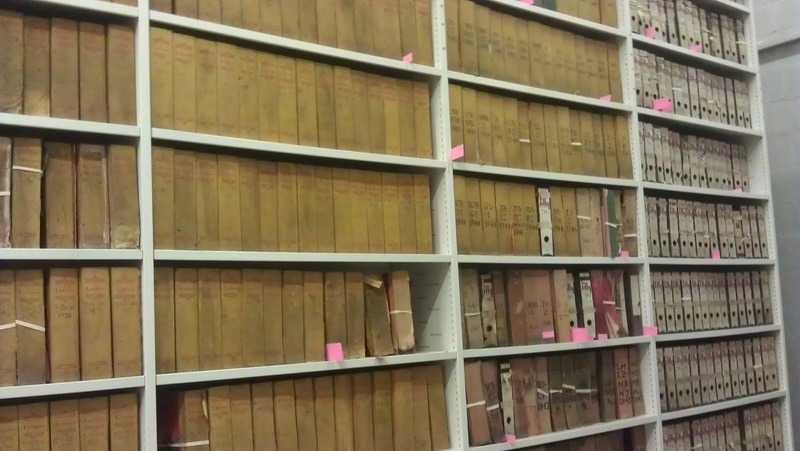 This particular collection contains approximately 140,000 case notes and now it has been (nearly!) 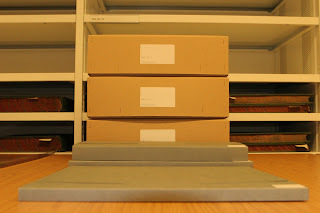 re-ordered is more accessible and ready for future conservation work. More information on case note re-ordering can be found on our website: Case Note Re-ordering web pages.